After the piece on the Today show aired over one thousand people ordered a total of 45,350 of our “Pay it Forward” cards. As of this writing, the total number of cards that we have distributed worldwide is now at a little over Three Hundred Fifty THOUSAND cards. It is truly difficult for me to wrap my head around that number. If even only 10% of those cards have been used, it’s still a tremendous number of people that have passed on kindness in Rees’ name. With those numbers I should be content in the knowledge that we have met our original goal of remembering our little boy in a positive way. I should be able to look at these incredible numbers and be content with the job we have done. It would be reasonable to assume that if I decided to walk away tomorrow I could do so with no regrets. I should be able to do these things, but I simply cannot. The reason why is simple: I constantly feel like I am not doing enough. No matter how many cards go out, I always feel like we could send out more. Regardless of the number of students I share our story with, I always feel like I can do a better job of getting our story across. The foundation has distributed almost 10,000 copies of the children’s book I wrote, yet I feel like that number would have been even higher at this point if I had done a better job of tightening up the narrative. If I let my mind wander, I can pick a thousand little things that bother me; all while conveniently ignoring our accomplishments. I should know better than to do it, yet my mind constantly betrays me at almost every step. As you may or may not be aware, I am a huge fan of Superman. I could write a novel about the significance of Superman and what he stands for in my life, but I’ll spare you that here. Being the fan that I am I of course was at the first showing of the newest Superman movie. I was not a big fan of the previous movie, “Man of Steel” mostly because I felt that movie got Superman all wrong. I went into this movie fearing the same thing, and as I watched the film I found that same disappointment creeping in. Gone was the Superman who was the unflinching bastion of goodness and hope and in his place was a good, but dour man who tries to be that but can’t stop letting doubt get in his way. As I continued to watch the film I was all but ready to echo the sentiments of all the critics who panned the movie, and in particular Superman himself. My mental pitchfork was almost at the ready to storm the screen when one scene changed it all. The scene that put all the pieces of the puzzle together for me involved a dream that Superman had of his adoptive human father telling him a story about how he and Clark’s grandfather saved their farm from a flood when Pa Kent was just a boy. Pa told Clark how he worked himself to near exhaustion, piling up rocks and sand to divert the flood waters away from their farm. His work paid off, and the farm was saved but at the unforeseen cost of the flood waters being diverted to the neighboring Lang farm. Unbeknownst to Pa Kent, as he was eating the “hero cake” his mother had baked for him, the flood waters were destroying the livelihood of their neighbors. The good news is we aren’t alone. Think of those numbers… 350,000 “Pay it Forward” cards, 10,000 books, 25,000 students (just this year), 67,126 facebook fans. Those numbers seem like a lot, but in reality they are represent only a tiny fraction of the 7 billion of us that share the Earth. I could sit here and lament the fact that so far we have only achieved a few drops in the bucket. The problem with that thinking was I only saw myself trying to fill that bucket, one drop at a time. I failed to realize that each of you touched by our movement represents more drops in the bucket. 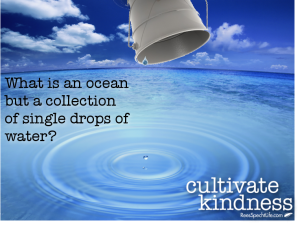 It’s not just me, or Samantha filling up the bucket – it’s all us collectively doing it, one drop of kindness at a time. Each time we pour out the kindness we have inside those drops come together. One drop of water in one bucket is nothing, but imagine what 452,126 drops all poured together would look like? It takes 90,840 drops of water to fill a one gallon bucket. If someone asked you to fill a bucket of water one drop at a time, by yourself (assuming a rate of 1 drop per second) it would take you 25.2 hours to fill that bucket. The notion of trying to fill a bucket in this way would stop any sane person from even starting the process to begin with – especially when they can go to any faucet and fill the bucket in seconds. I bet you have never given a moment’s pause to filling a bucket of water in your life. The reason: You never had to consider all the drops that were needed to fill that bucket. In other words, we take filling the bucket for granted because of the simplicity the act engenders. I imagine that a great many people won’t read past that first paragraph. For many, I think that first paragraph would be the confirmation to something they may have thought all along: Good things never last… Yep, the world always finds a way to crush a good thing. That introduction would have confirmed their belief and they would move on. If you are here still reading this I applaud you. You are not willing to give up on the world – and neither am I. So what is with all the negativity I wrote about above? The answer is simple: Those are the thoughts that go through my head all the time. Those are my fears, laid bare, that I wrestle with every single day of my life. The scary part is that those are just my fears in relation to our movement. I would need a lot more than a paragraph to write about all my other fears – and I suspect that you would find yourself in the same boat. Fear is a constant in our lives. Fear is natural and it can be a very powerful motivator, if not the most powerful motivator. The thing about fear is that it is not real. It is made up in our minds to serve as a reminder, and nothing more. President Roosevelt was absolutely correct in his assertion that “The only thing we have to fear, is fear itself”. The President was reminding us that fear is only as real as we make it – and only as important as to the station we elevate it to. In a sense, he was telling us all that we really have the choice between fear’s yin and hope’s yang. Hope, on the other hand is fear’s inverted twin. I truly believe that a line exists, somewhere in the primal part of our brain, that divides where fear and hope stake a claim to our souls. I imagine the fear side looks like a series of highway advertisements all crowded into a tiny landscape. The signs are brightly colored and flashy in order to catch your eye. They hold nothing back in their graphic depiction of every threat that faces you. The hope side is its complete contrast: Full of large, lush meadows and beautiful vistas – inviting and serene. The landscape is the epitome of Eden in its vastness and majesty. I will be completely honest; there are several times over the past three years where I came perilously close to getting off, and staying at, fear’s exit. One of those moments happened to me recently. Due to a scheduling conflict that I was not informed of I had to do a kindness presentation for a mixed group of students in the 1st and 4th grades. I have several versions of the presentation that I do which are geared for different age groups. My k-2 program uses the book I wrote and its message of kindness as the backdrop to telling our kindness story. I never actually tell those students that Rees was a real boy. They just see him as a superhero of kindness that wants to go out and spread the seeds of kindness. For grades 3-5 I do share some of our family’s story and a little about our movement. It’s a little heavier, but I do not actually reference Rees’ passing (I just refer to it as a bad accident). As an educator, I know what is appropriate for what grade levels and that is precisely why I made the separate programs. I actually received eight reviews on that one performance. Six of them were fantastic (rated excellent) – and 2 were not ( rated fair and “good”). I fell for the lure of fear. I only chose to look at those 2 negative reviews and focused on them. I started to question everything I was doing. Once I started doing that, the other questions I had started popping up. I questioned the financial burden I am placing on my family by taking an almost 50% pay cut from my teaching salary to spread this message. I started “rationalizing” that the reason I could not find a publisher for my children’s book was because it just wasn’t good enough. In fact, every thought I listed in that first paragraph came to the fore. Every single one of those thoughts made the bright lights and enticing lure of those exit signs to fear seem so much more alluring. I was ready to give it all up and accept defeat. I kept driving. I know that hope is on the horizon, and I realize I need to stay the path, no matter how difficult the road ahead appears. Giving into fear is the easy way off the path. If I didn’t take that exit when I lost my little boy, I certainly can’t take it now. I realize that this movement will always mean more to Samantha and I than to anyone else – and even if we are the last two people to care about what we are doing then it is worth it. I need to realize that if even one child in that presentation was touched by our message that day, then the presentation was a success. I have to focus on the fact that change does not occur instantaneously… Change happens slowly, a piece at a time. I am not giving up! I will never give up. I’ll use that towel to wipe away the sweat that forms as I push my way along my journey. I will decide what gets written on that wall, and it will never be “I QUIT!”. Our movement was in the news yesterday and it’s time will come. In reality, change happens so slowly that sometimes we can’t perceive it – but that doesn’t mean Rees’ story isn’t making a difference. If only one child has been positively affected by our message of kindness then we have succeeded. I can do much more, and I WILL. Our scholarships have helped 11 students so far who would otherwise not have been able to pay college expenses. Spreading kindness is not only a real thing, it’s the most important thing there is. Fads, like our infatuation with celebrities, come and go but Rees’ legacy will live on in every kind act performed in his name. I’m doing this because I will never let go of the love for my only son, and I will never let him go. He will be with me forever – and that love continues to grow, one Rees’ piece at a time. p.s. A very special thank you to my mentor, friend and fellow wounded healer Bobby Petrocelli. Thank you for reminding me that we all matter, and that I need to keep doing the job I am meant to do. Your kindness made (and continues to make) a difference for me. If time “flies” when you are having fun, it enters warp-speed when you are grieving the loss of a child. It’s hard to believe that we are now in the fourth year of our mission to spread kindness in our late son’s name. It’s even harder to reconcile the fact that my little boy’s laughter has not filled our home for more than three years now. It has been more than one thousand days since I have held, tickled, teased or cradled him. The passage of all that time has done nothing to ease the pain of his absence. 1,000 days sounds like so much time, yet if I gauge that time based on my level of pain, it would seem no time has passed at all. Today hurts just as much as day one did three years ago. When we first lost Rees time seemed to stand still. It was agonizingly slow, with every tic of the clock seeming to teeter on the edge of infinity. The pain was omnipresent and unrelenting; it marred every single waking moment. This is pretty much how things kept going right up until the one year anniversary. When October 27th, 2013 rolled around it paradoxically felt at once like it took an instant AND an eternity to get there. Things changed after that day… Time started to accelerate, and it has not slowed down since. As I sit back and try to analyze why the time has moved so fast I can find only one conclusion: It’s all about distraction. I have distracted my way through these three years with things that keep me from focusing on my pain – and since the pain doesn’t go away I find myself constantly distracted. I have become a master of distracting myself from my pain. 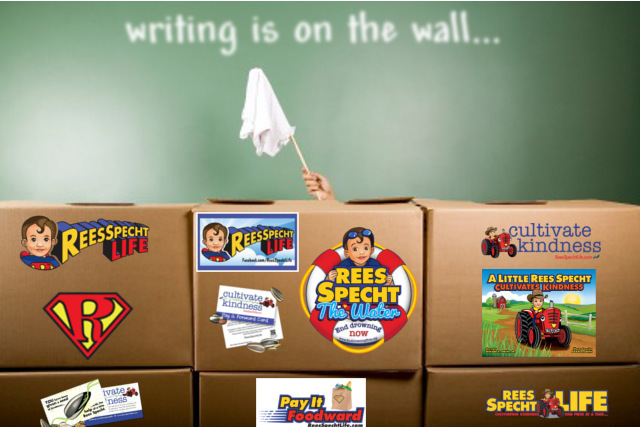 It turns out that the foundation and movement we started in Rees’ name proved the ultimate distraction. Every moment I spent on building the movement and spreading kindness in his name was one less moment in which I had to reconcile with the pain. Ironically, in promoting kindness to others, I was actually proving to be most unkind to someone rather important: myself. I really didn’t realize just how unkind to myself I was being until December 19th, 2015 – what would have been Rees’ fourth birthday. On that day, I found myself in a movie theater watching the newest Star Wars Movie for the second time in two days. Right before the opening crawl of the movie I vividly remember the feeling of anticipation that I had to see the movie again. It was such an odd feeling that I remarked to my friend who invited me about how weird it was to be this excited again. “Just imagine how excited you will be next year when the NEXT Star Wars movie comes out – or when episode 8 comes out in 2 years” was his immediate reply. I smiled in response, holding back the unexpected, and troubling, words that immediately formed in my head: Yeah, that’s if I live long enough to see them. If I live long enough to see them??? Those words echoed in my head so loudly that they drowned out the blaring orchestra playing the Star Wars theme. For the first time in my life I questioned whether or not I would be around in the near future and right there, in the middle of a movie theater, I questioned why I had just thought that. The answer wasn’t long in coming. In fact it was always there… hidden behind all the distractions that I so expertly created in the past few years. My subconscious finally had the nerve to tell me that with everything I was doing I had forsaken my own health and well-being in order to avoid the pain. I was hiding from that pain in every way possible and it was literally killing me. I was being unkind to myself and I didn’t realize it until that moment… As I look back now I wonder how it took me so long to recognize that I was hurting myself and, at times, others through my constant distractions. I was so hyper-focused on creating a legacy for Rees that I was shutting out some of the most important things in my life; all to the detriment of my physical and mental health. It’s funny, but I know that if you could rewind the clock and talk to the me before December 19th, he would tell you that everything he was doing was helping with the mental/emotional strain that Rees’ death had created. By going out to speak to schools and writing books and maintaining a social media presence, past me thought he was doing what he needed to keep his brain active and channel his pain. In retrospect, I now know that all I was doing was hiding behind these tasks in a vain effort to shelter from the pain. In order to shelter yourself from pain, you need to isolate yourself. I didn’t realize what I was doing was isolating myself… I mean how could that be? I literally was speaking to thousands of people and putting myself out there. The problem was that the part that was going out there was the facade built up to hide the pain I was sheltering. The problem with facades is that they are not inherently structural. Facades are meant to look good on the outside and that is all. The real me was hiding within. Afraid. Scared. In pain. What was worse is that the facade didn’t just hide the real me from the world… it hid the real me from myself. Facades cannot last long if the the structure upon which they are built is unsound. As the stress builds, cracks form. If left untreated, those cracks grow into fissures that eventually will cause the facade to crumble. Sure, you can hide the cracks with filler and paint, but that is purely cosmetic. Eventually, the structure within will fail and everything comes crashing down. For some reason (I’d like to think it was Rees telling me on his birthday), in that moment of enlightenment in a dark theater I realized the structure within was failing and unless something was done right away, I was going to crumble. That thought occurred in my head that was attached to an almost 400 pound body that was uncomfortably wedged into a movie theater seat not meant for my girth. I have dealt with weight issues almost my entire life, with my weight fluctuating by 50-75 pounds in any given year but always hovering near the 300 pound mark. That was until Rees passed away. After he died, I slowly started packing on the pounds. Sure, I would notice every once in a while and lose a little weight here and there but, inevitably, the weight would always come back and then some. I will be honest, I was never self-loathing or upset too much about my weight. There was never a sense of urgency to lose it. I always felt like I would get rid of it one day. There should have been moments before my epiphany in December that got me to do something about it. A big wake up call should have been when a former Biggest Loser contestant contacted me right after Samantha and I appeared on Fox and Friends in December of 2013. When I look at that video, and really any other pictures – I wonder how I did not see it myself. I knew I should lose weight, but I never really wanted to lose weight. That all changed on that day in the theater. 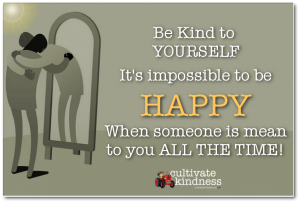 It was the first time I realized that I was not being kind to myself and my subconscious was finally realizing it. Even though the realization that I was not being kind to myself came on the 19th of December, I realized that I couldn’t just jump into making a life-long change. I needed to plan this out and set realistic goals for myself that were slow and steady. That was more difficult than anything else – as I tend to be incredibly impatient and impulsive. Recognizing those faults, I made sure to plan out exactly what my goals would be and how I would do it. I am proud to say that I am 60 days into my plan and have not faltered. I have either gone out for a run every morning or been to the gym for every single one of those 60 days… including the day of the big blizzard that hit us. Even though my heaviest was 400 pounds, I was not 400 when I started. I know I had lost weight over the summer – but sadly my scale couldn’t measure me at that weight. I estimated my weight to be between 360 – 375 lbs when I started the process. I am now down to 322. On my first day I was able to run a mile in 22:41. I have since cut that time to 11:23. The facade I saw in the mirror was literally melting away, revealing a reflection that was more in line with how I feel inside now. I was hiding my pain in plain sight. It manifested in every cookie, donut, fast-food etc. that I put in my mouth. Every pound I gained in the last three years was a reflection of the pain I was trying to hide. I thought I could hide from that pain by being kind to others and spreading our message of hope. The problem was that I wasn’t being kind to myself at all – and even though I was accomplishing my goal of honoring Rees, I was hurting myself in the process. When I think about where I am now, I find myself again amazed that I was able to keep true to my goal of being kind to myself for 60 days. Those 60 days seemed like such a long time when I set out to do this. It really shouldn’t have though. Time is still flying just as fast as it was before I realized I needed to be kind to myself. The only difference now is that instead of hiding the pain with distractions, I have turned it into the fuel that has driven me to not only make others feel better, but to do the same for myself. For the first time in the past three years I am fully prepared to make this world a kinder place, and I realize that the process must include myself. 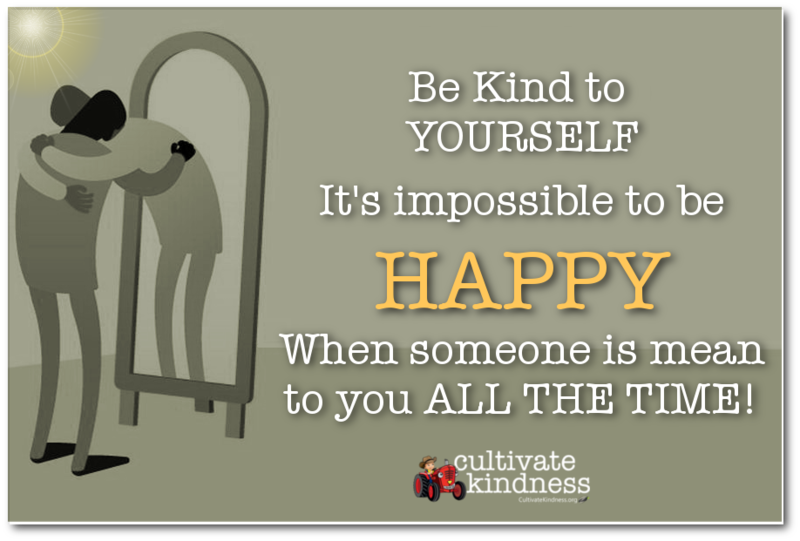 Take it to someone who knows it well… true happiness just isn’t possible if you can’t be kind to yourself. I’m done hiding behind the facade. I am ready to be kind to myself, one little piece at a time.